The winner of the Thank You Book is Alison Wells! I love these principles. They are the 5 principles of the healing art of Reiki. You can keep your commandments, - these are my kind of ‘rules’ mainly because they are not rules but aspirations and they focus on the positive. I would love to be able to tell you that I live by these tenets. I do try. I usually fail. Wouldn’t it be great to ‘never worry’? I find the ‘being kind of living things’ the easiest to accomplish – particularly kindness to living things with four legs – they tend not to give backchat which definitely makes them easier to be kind to! ‘Giving thanks for my many blessings’ is probably one of the easiest to forget to do regularly and although it sounds easy, it takes a little an effort to achieve. I often think back to the first few months after I ‘retired’ from the world of full time work to become a stay at home mother (or lazy sponger according to Emer O Kelly). When I no longer had to race at breakneck speed through my days, juggling childcare, domestic chores and the demands of full time working, I suddenly began to notice the small things that previously I had been blind to. I began to get glimpses of the world through the eyes of my children. Like a cartoon character slowing down, the background of my life suddenly became vivid and wonderfully eclectic. I began to notice the small things that lent colour and texture to my days. I made a list. I called it My Simple Pleasures. A warm fragrant bubble bath before bed. Coming home to find my cats all curled up and content in various corners of the house. The silence that slowly envelopes the house, as humans and animals take to sleep. Watching the birds feed from the feeders hanging from the tree just outside the window. The taste of chocolate cake about 20 minutes after it comes out of the oven. The comfort of knowing that everyone is in on a stormy winter night. The chatter of family conversation over Sunday roast. Seeing a washing line full of washing on a bright and breezy day. Coming across a squirrel while on a walk in the park. A warm sunny summer afternoon spent reading in the garden. Our postmen – who seem to always be cheerful. Going for a walk and realising that Ireland is still a country where strangers often smile and say hello as they pass by. Fridays – no homework, no cooking and no school lunches till Monday. Coffee and a scone at the kitchen table, while reading the paper, having completed the weekly marathon of grocery shopping. How beautiful my garden looks on a frosty bright winter morning. A sunrise walk on Dun Laoghaire Pier. Listening to my kids deep in childish conversation, oblivious to my presence. If I am having a bad day or am just feeling down, I sometimes take out this list and remind myself of these little things that make life worthwhile. I am determined to never again be so harried that I miss the beauty and simple pleasures that are all around. The Hospice Foundation has cottoned on to this ‘attitude of gratitude’. They say that “gratitude is good for you” and that there is scientific evidence to back this up. So, in their wisdom they have designated next Thursday 24th November as National Thank You Day and to help us to practice gratitude in our day to day lives, they have produced a Thank You Book. This book is a journal, full of blank pages in which to record your own gratitude, your thankfulness for the things which make you smile, which lift your spirits, which make your life good. To help you get started there is a wise and gentle forward written by Roisin Ingle and the first few pages feature simple messages of gratitude from some well known personalities. The nice people at The Hospice Foundation kindly sent me a Thank You Book so I could test drive a daily practice of gratitude. “Piece of cake”, I thought, “I’ve done Reiki don’tchya know, I know all about this gratitude stuff.” Well two weeks in, let me tell you it’s not quite as easy as it might seem. 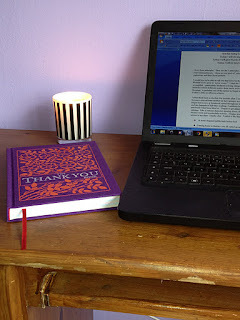 I began by placing my lovely Thank You book on my bedside table in order to record my gratitude for good things that happened at the end of the day. But one week in, I found that I kept recording variations of the same thing. “Today I am grateful for my warm, cosy bed.” “Thank you for the gift of a good night’s sleep.” Then there were a few nights when I was so tired getting into bed that I just couldn’t manage to record anything. So I have now taken my Thank You Book and placed it on my desk. The idea being that first thing in the morning before I turn on my laptop, I take my journal and I record a simple pleasure. They say it takes 21 days to make or break a habit so I guess I am starting again now. So I hereby undertake for the next 21 days I will write down at least one thing every morning. After that it should be a walk in the park! And hopefully I will have shifted some gear in my brain which will cause me to look at life, most of the time, with a ‘glass half full’ mentality. Ohhh I wish that didn’t remind me of chocolate! But there you go – my entry for today. “Thank you for chocolate – especially Green & Black’s Mint Chocolate.” Gosh – I hope I am doing this right! STOP PRESS: To mark Thank You Day the Irish Hospice Foundation have given me another copy of The Thank You Book to give away from My Kitchen Table. To be in with a chance to win this gorgeous book which will kick start your own gratitude habit, just leave me a comment. A winner will be chosen on Thank You Day which is 24th November. Good Luck! Barbara, so true, it is difficult at the moment, there is so much negativity around. I agree with the principles of it and what a great initiative by the Irish Hospice Foundation, they took great care of my dad many moons ago. Good luck with your thank you book. Oh Barbara, my cats most definitely give backchat. They are so full of attitude sometimes... but I still adore them, and do you really manage to wait 20 minutes before eating home-baked chocolate cake!! Seriously though, I love your list of Simple Pleasures. I may try to do one of my own. Sometimes it's hard to motivate yourself to be grateful for anything after a long hard day, but I like the idea that this is a habit that can be formed. We have so much to be thankful for, all of us. It's good to remind ourselves - and be reminded - of that. A lovely piece, Barbara. One the most important principles in my life is simply saying 'thank you' to people for what they do. Easy thing to say but something I don't do often enough, especially to the people who matter most. I'm sure I'm not alone in that! Thanks Barbara. This was just what I needed to read today. I love the smile from a stranger, coming across a squirrel, Fridays and no homework or lunches to make, a walk on Dun Laogharie pier - for me it's Portmarnock beach - and I think the idea of a thank you book is genius.....going out to get one tomorrow! Aw Barbara, that is lovely, you are right, it is often harder to be grateful for good things in our life, then complaining about what is wrong in our lives. Gratitude and 'keeping things simple' are also part of AA and these are so important and everyone should try to live by these little slogans, it makes life so much easier! I love watching the children in their pjs watching a movie by the fire on a cold winter's night. Knowing they are safe and content! What a great idea both the Thank You Book and your own Simple Pleasures list. You have given me food for thought. Everyday I try to do a random act of kindness, something small like letting the harried shopper skip ahead of me in the supermarket or kind words of encouragement to someone on twitter. Smiles are important too, I'm sure people think me nuts as I smile broadly at them on my daily walks. Now to think of my simple pleasures. Such a perfect sentiment. It's certainly something I'm trying to do more and more, to invest the energy of positivity into my family and to teach my children to notice one or two good things everyday, to note that many worries will pass and that even in darker times there are still many many wonderful things to enjoy. I'm grateful that my 2 year old has finally gone asleep at 10.30pm so I can read your blog post! Sometimes I tell my clients - if you can't do "just for today..." do "just for an hour". Taking smaller chunks of time can make things seem more bearable. So if you have trouble with 21 days, then "just for this week..." and if a week is too long, "just for today". Perfect! What a gorgeous post it brought tears to my eyes I am reading this in bed at 6 am because I couldn't stop coughing but I'm thankful that I'm in my own bed and not a hospital one. I think I may keep a thank you book too. read your blog at 6am and am starting my day with a joyous heart. Even though I have to attend a funeral this morning, I am grateful for everything i have. I will be buying the book! Thnak you. As I was reading this, himself appeared with a cup of coffee for me. This is something he does, unprompted, any morning he's here. He does so many little things that make my life easier, on a daily basis. Your lovely piece has reminded me to appreciate and say thank you more often. I am truly blessed. Delighte with all the wonderful positive comments - yizzir all in the hat for the draw next week!!! Love your simple pleasure list! A bubble bath for me, a walk in the park with the leaves falling... the first sip of wine in the evening. I was going to leave a comment anyway & then I noticed I'm in a draw for a copy of a lovely Thank you book. I love your description of being able to be more appreciative of the simple but wonderful aspects of life after you swop the treadmill for minding your children yourself -I sure know what you mean. A regular gratitude list has long been a habit of mine. The Attitude of Gratitude is a wonderful attitude to adopt. My girls and I have 'Gratitude Books' wherein we write the things we are grateful for every day. It's a wonderful thing to reflect on before going to sleep. Often, I will ask myself 'If I woke up tomorrow with nothing but the things I said "thanks" for today, what would I have?' It's a great way to really see what you have. Especially when are constantly being told - as a nation - that we are impoverished. Barbara, you are a girl after my own heart. The attitude of gratitude - thats a great idea... with so much to worry about these days, its importent to count our blessings. What a lovely post. I enjoyed your Simple Pleasures list, most of them would be on mine too. before I go to sleep each night I write down five things I am grateful for that happened that day. there are nights I am hard pressed because the day has been hard, but then I realize I am grateful I survived the day with some fraction of sanity to live another day. Something I am always grateful for. My life has been transformed over the past few years through practising gratitude about everything in my life. So much unhappiness is due to people wanting things they can't have instead of being grateful for every small joy or gift of friendship. I wrote about all the people who have given me support or who just helped me to move on in my life. It was a very long list and I realised that I was grateful on so many levels to so many people. I too am a Reiki master and love those words. It was good to be reminded of them and to know that other people are living those precepts. Your list of things to be grateful about could be my list and everybody's list - with a very few alterations - people just need to be aware. Wow. What a nice thing to do. Thank you for the link and for the idea. I think I will do the same, Barbara. I will make a list, too. Oh my goodness... 33 comments.. I am so thrilled and delighted with the response to this post which clearly hit a nerve with so many of you. Tomorrow is Thank You Day and Thanksgiving Day in the US.. let us all make it the beginning of practicing gratitude in our lives every day..
Today I am so thankful to each and every one of you for making this post so worthwhile! Fantastic piece Barbara, for me the gratitude habit is one that can be developed and honed in the same way that the 'woe is me' habit is perfected by a lot of us. The Thank You Book is a great idea to get you into a mode of 'looking for things to be grateful for' during the day and thereby shifting ones outlook entirely! Louise Hay is a great champion of the power of the Gratitude Journal and she is doing okay with it! Oh and as for the chocolate, mine is Willies Cacao ...don't tell anyone but ... they have it in Cavistons and The English Market, for the southerners! Thank you. The older I get the more precious every day is, I love the world, and I don't want to miss the happiness of just being here. Much love to you.